Chocolate lovers, here is another reason to celebrate. 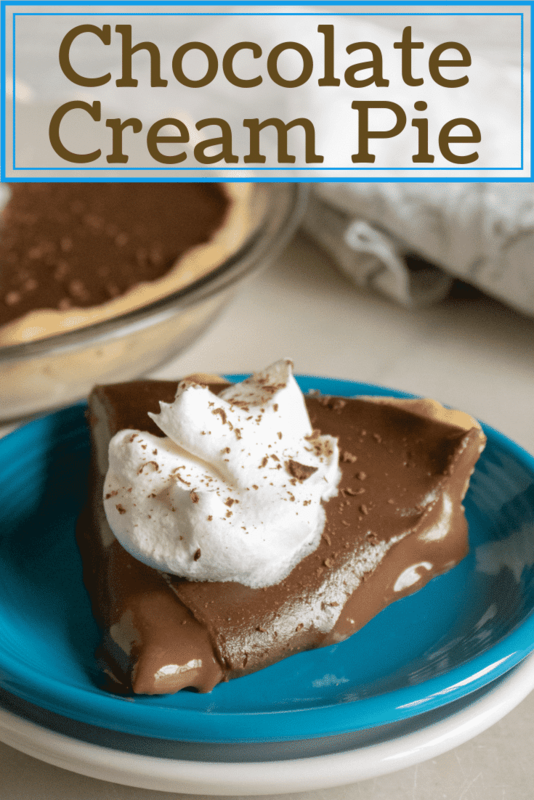 This recipe for Easy Chocolate Cream Pie is full of rich decadent chocolate flavor, plus it is quick and easy to put together. Perfect for your upcoming Valentine’s Day celebration, or anytime you want to satisfy that chocolate craving. 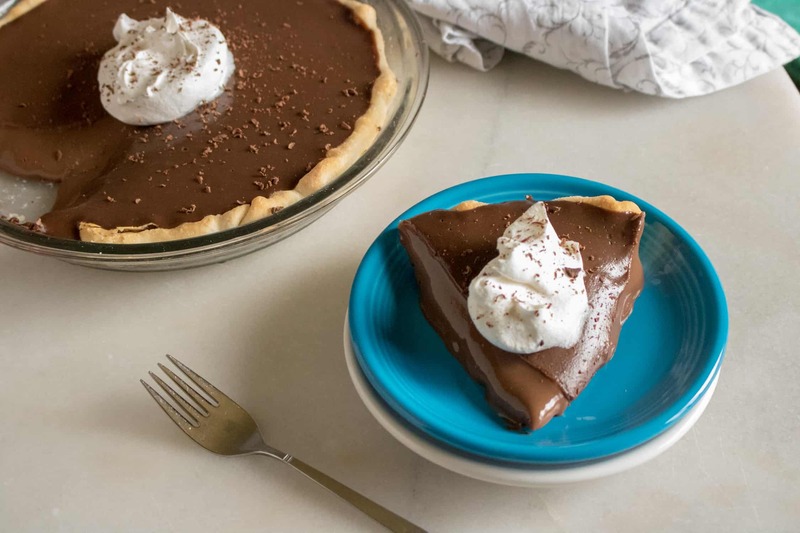 While some chocolate pies require baking time, to make this Easy Chocolate Cream Pie all that is needed is a large saucepan and a pre-baked pie shell. 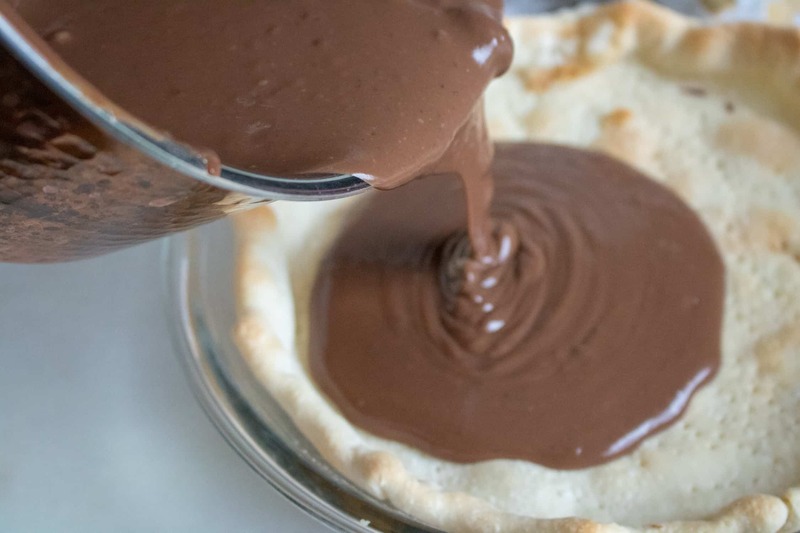 Then you simply heating the sugar, flour, milk and chocolate until the chocolate is fully melted and the mixture begins to bubble. And the next step is to add the eggs, BUT you don’t want to add them right into the hot mixture. Because that would leave you with scrambled eggs in chocolate, which is not too appetizing. Instead you want to temper your eggs. How Do You Temper Eggs? The goal of tempering eggs is to slowly bring them up to temperature without scrambling them. To do this you allow your hot mixture to slightly cool by removing it from your heat source. Next, you add a small amount of the warmed mixture to a separate bowl with your eggs. 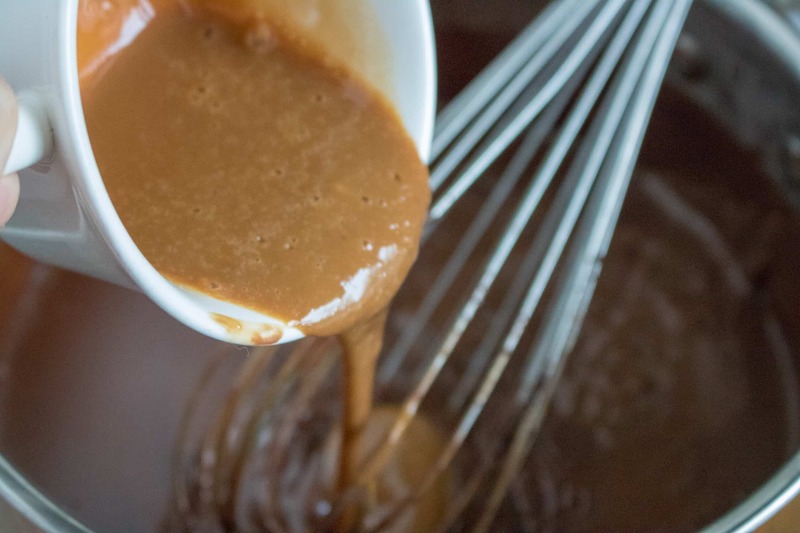 Whisk the chocolate mixture with your eggs. This slightly warms your eggs and gets them ready to be added to the larger bowl of chocolate pie filling. 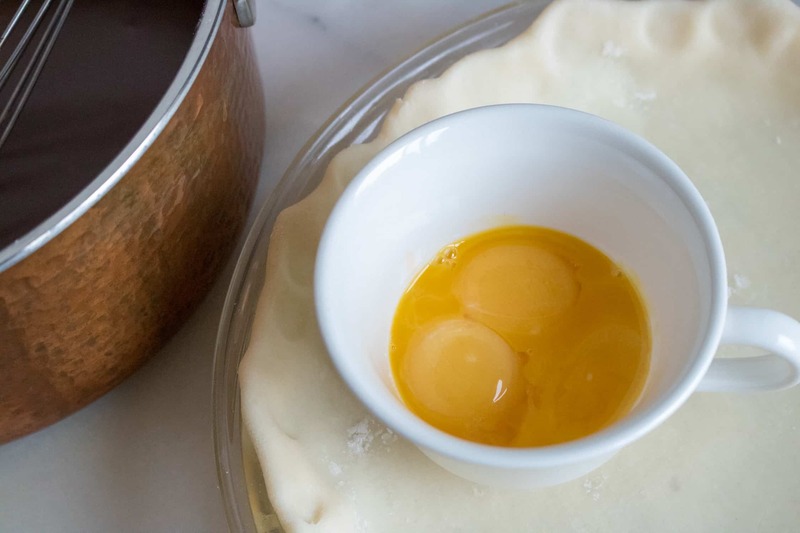 Once your eggs are tempered you can add the egg mixture to your pie filling. Tempering first helps prevent your eggs from scrambling and becoming a hot mess. Tempering eggs is a technique that is also helpful when making dishes such as custards, eggnog and mousses. Can I Make My Own Pie Crust? Of course you can! I love using pre-made pie crust when I am short on time because they help me get recipes put together much more quickly. But making you own homemade pie crust is a great way to take this recipe to another level. I’m always on the hunt for a great homemade pie crust. 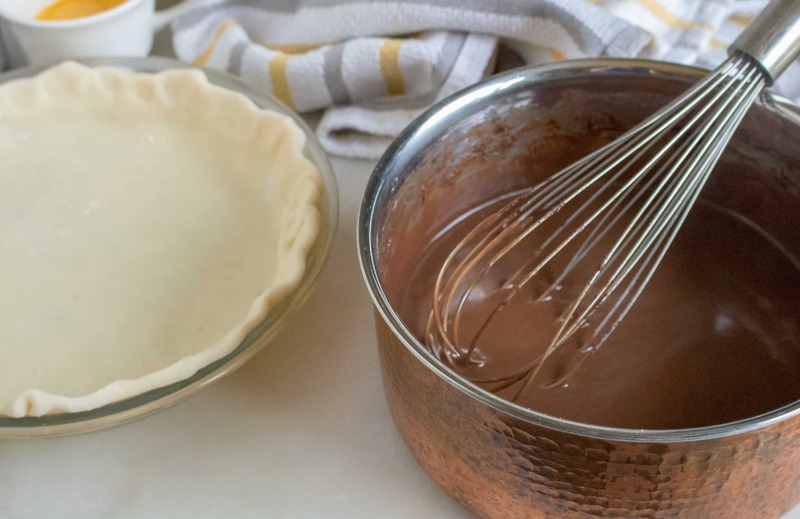 Do you have a go-to recipe for making the perfect pie crust? Let me know by dropping me a note in the comments section below! Step #1: Combine sugar, flour, milk, and chopped up chocolate in 2 quart saucepan. Step #2: Stirring constantly, cook over medium heat until mixture begins to bubble. Continue stirring for 2 minutes. Step #3: Next, mix a little of the hot mixture into the egg yolks, beating rapidly to avoid cooking the yolks. Step #4: Stir the warm yolk mixture into the remainder of the chocolate mixture and then cook for an additional 90 seconds. Step #5: Remove from heat, and then stir in butter or margarine and vanilla. Pour filling into pie shell, and chill until set. Step #6: Top with whipped topping and a little grated chocolate. Serve and Enjoy! 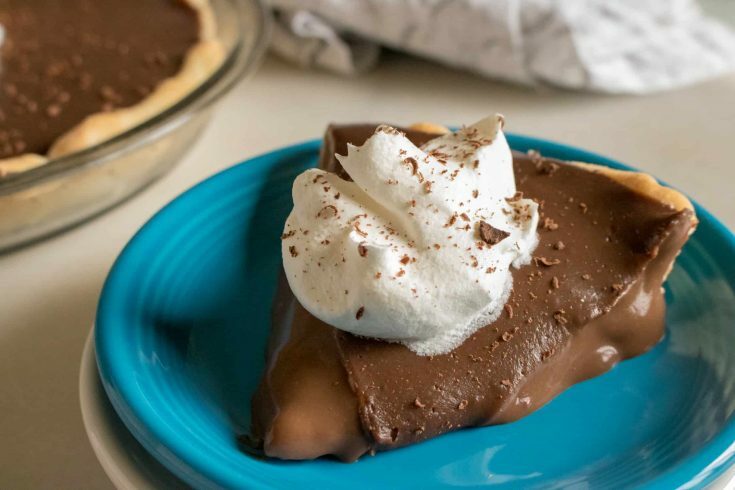 This Easy Chocolate Cream Pie is full of rich decadent chocolate flavor and comes together so easily. No baking required! 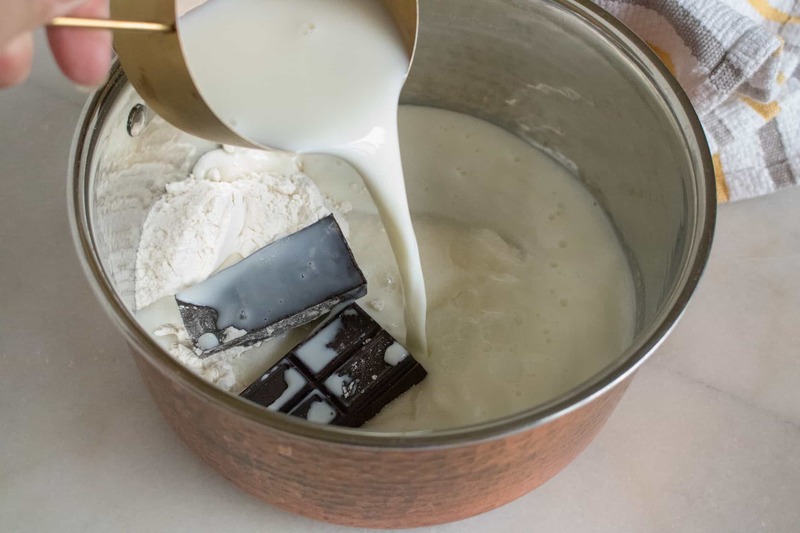 Combine sugar, flour, milk, and chopped up chocolate in 2 quart saucepan. Stirring constantly, cook over medium heat until mixture begins to bubble. Continue stirring for 2 minutes. Mix a little of the hot mixture into the egg yolks, beating rapidly to avoid cooking the yolks. Stir the warm yolk mixture into the remainder of the chocolate mixture, and cook for an additional 90 seconds. Remove from heat, and stir in butter or margarine and vanilla. Pour filling into pie shell, and chill until set. Top with whipped topping, and a little grated chocolate.